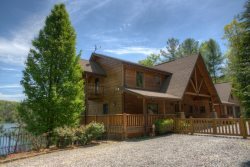 Reserve a tee time and experience some of the most beautiful North Georgia golf courses during your stay at our cabin rentals. North Georgia golf courses are surrounded by the majestic beauty of mountains and terrain. Take in an invigorating 18 holes of golf on Innsbruck's championship course, and receive an excellent golf package as a guest of Pinnacle while staying at any of our Innsbruck properties! Championship golf course designed by Bill Watts, rated among the Golf Digest`s Best Places to Play 2008/2009. Take in an invigorating 18 holes of golf on Innsbruck`s championship course, and receive an excellent golf package as a guest of Pinnacle while staying at any of our Innsbruck properties! Ranked by both Golf Digest and Leading Golf Courses of America as one of the top courses to play in Georgia.